When my boys were little I really didn't invest in early learning products, mainly because I wasn't aware of them. By the time I became aware of what Baby Einstein videos were, my youngest had just about outgrown them, but we did purchase one and he loved it. I wish then that I had had them available for each of my children. Now, Baby Einstein has turned over a whole new leaf and have developed new Discovery Kits to help children learn in a fun and interactive way. "Baby Einstein Discovery Kits (which are each packaged to include a Baby Einstein DVD, a music CD and either a book or Discovery Cards) are designed to help provide parents with new ways to introduce their little ones to the world around them in playful and engaging ways. The kits not only promote discovery and inspire baby’s natural curiosities but they also encourage parents to look to their everyday experiences as a way to extend content beyond just the kit." The Discovery Kits are divided into three unique levels that are appropriate for children ages birth to two years, as they grow and learn. Level 1 kits are designed to help your baby experience music from classical composers such as Mozart and Beethoven. The music is modified for baby's ears and enhanced with images that are baby friendly as well as puppet shows. Level 2 kits let your little ones explore the world around them including nature, around the home and the ocean. Lastly, Level 3 kits allow babies to express themselves with colors, words and music as they watch friendly puppets like Vincent Van Goat and Coco the Cockatoo. Baby Einstein released three new Discovery Kits on February 22nd. Baby Lullaby is a level 1 kit that takes baby on a soothing journey with classic lullabies. 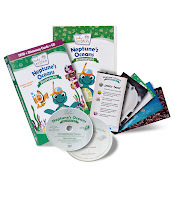 Neptune's Ocean is a level 2 kit that includes a voyage of underseas discovery and World of Rhythm is a level 3 kit that involves fun puppets sharing the excitement of rhythm with your baby. Baby Einstein Discovery Kits can be purchased at local retailers throughout the US and Canada. They can also be purchased online from the Baby Einstein website and from Amazon for $14.99. * Baby Einstein provided a free Discovery Kit for giveaway on this blog, but no compensation was received for this post and all words, thoughts and opinions expressed here are entirely my own. I like the Animals Around Me discovery kit! I would love to get the World of Words for my boys, it is one that I haven't seen before. Would love the wild animal kit! I'M not sure how to post correctly on the blog for your Baby Einstein giveaway. Im new 2 this way. Can you help me? I'd be real thankful 2 learn the proper way! I do however already like Baby Einstein on FB, and your page there 2. I plan on refreshing my password on Twitter & following your blog & Baby Einstein as well. However I most often use FB. Im a single mom to a baby boy who just turned 8months old. He seems to have talent for hearing music a lot better than mommy. He came to my life by a shocking & sad situation, but I chose life for him for very many personal & moral + health reasons. Now I'm finally doing better with attachment & responsible for his development & healthy start & finish in life for hopefully all of 120 years ahead:-)! Ocean, but Baby Lullaby is also so incredibly soothing & any infant age apropriete in my view. I'd like the Baby Mozart Discovery Kit. I love the Baby Beethoven Kit! I would love the world of words discovery kit. Animals around me would be my first choice. My daughter is just starting to be fascinated with animals. I'd love to give the Animals Around Me kit to my friend's brother and his wife. Their whole family are very caring towards animals, and I know they'll pass that attribute to their child. My son would love the Animals Around Me Discovery Kit. He's only 7 months old, but adores animals!! I love the Neptune's discovery kit! I would choose the Animals Around Me discovery kit! I Like Baby Einstein on Facebook. Follow Baby Einstein on Twitter. The World of Rhythm kit would be fun for my music loving grandson! I would like World of Colors. I entered the Lysol Mission for Health giveaway. I would love to have the World of Words for my baby. I would love the Baby Lullaby kit. I would love to have the World of Words Discovery Kit for my daughter. I think my sons would like the Animals Around Me disovery kit. My two year old loves animals and we just recently started watching the other Baby Einstein videos we have for my four month old and my tow year old is really into telling me what he sees. LOL. I would choose the World of Words.